Bloodshot eyes occur commonly in children, usually reflecting inflammation of the eye surface. This leads to dilation of tiny surface blood vessels and the appearance of bloodshot eyes. Although this symptom may be alarming, the underlying cause is often not serious. Common causes of bloodshot eyes in children include infections, allergies and irritants. See your healthcare provider for an accurate diagnosis and appropriate treatment if your child has bloodshot eyes. Most cases of bloodshot eyes in children are due to a superficial bacterial or viral infection. Known as infectious conjunctivitis or pink eye, this condition involves infection of the thin membrane that covers the eye surface and the inside of the eyelids. It can be difficult to distinguish between viral and bacterial conjunctivitis as the symptoms overlap. However, thick eye discharge occurs more commonly with a bacterial infection. Clear, watery eye discharge is more likely with viral conjunctivitis. Infectious conjunctivitis can develop in association with a head cold, sore throat or an ear infection, but it can also occur on its own. One eye is commonly affected initially, but the infection typically spreads to both eyes. Children with hay fever or other airborne allergies commonly develop eye symptoms, including slightly bloodshot eyes. Just as allergy-triggering substances in the air enter the nose and cause nasal symptoms, those same substances can get into the eyes and provoke an irritating allergic reaction. Airborne pollen, mold spores, animal dander and dust mite debris are common triggers for allergy-related eye symptoms -- a condition known as ocular allergy or allergic conjunctivitis. Children with ocular allergies typically experience simultaneous nasal allergy symptoms, including sneezing, stuffiness and a runny nose. Eye rubbing due to itchiness is also common. You might notice dark circles under your child's eyes, commonly known as allergic shiners. Chemical or physical irritants might be to blame for your child's bloodshot eyes. Common culprits include chlorine from a swimming pool, smoke, chemical fumes, strong fragrances, high wind, and cold or dry air. Reflection of bright sunlight off water or snow can also irritate your child's eyes, leading to a bloodshot appearance. If your child wears contact lenses, overuse or sensitivity to cleaning or wetting solutions are possible culprits. Dust or dirt that gets into the eyes can cause physical irritation and redness. 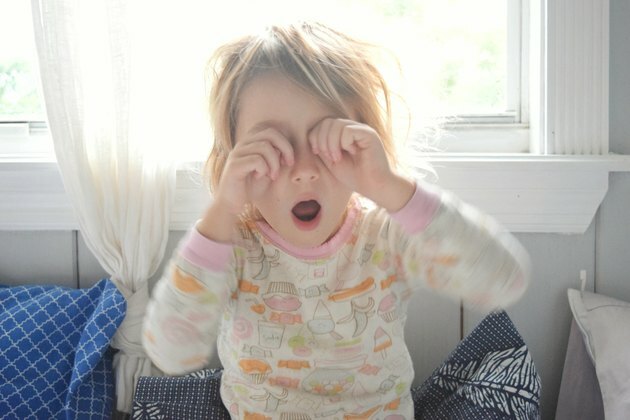 Rubbing the eyes in this situation might scratch the surface of the eye, leading to further irritation and discomfort. Rarely, bloodshot eyes in a child signal a potentially serious systemic disease or eye disorder. For example, Kawasaki disease causes widespread inflammation of the blood vessels of the body, which can manifest as bloodshot eyes along with reddened lips, palms and soles. Measles, chickenpox and fifth disease are other examples of childhood illnesses that can cause eye redness, along with a rash, fever and other symptoms. Eye disorders that cause redness or bloodshot eyes occur more commonly in adults than children. However, children are sometimes affected. For example, an inflammatory eye disorder called uveitis may initially come to a parent's or healthcare provider's attention due to eye redness and pain. Light sensitivity is also typically present. Uveitis often occurs in conjunction with another illness, such as juvenile arthritis and certain types of kidney disease. Other inflammatory disorders of the eye called episcleritis and scleritis also rarely affect children and may lead to symptoms similar to conjunctivitis. Although many conditions associated with bloodshot eyes in children are not serious, it's important to contact your doctor as soon as possible to determine the cause and initiate appropriate treatment. Therapy depends on the underlying cause. For example, antibiotic ointment or eye drops are usually prescribed for bacterial conjunctivitis. Antihistamines and artificial tears are often recommended for allergic conjunctivitis. A cool washcloth over the eyes can provide temporary relief from eye itchiness and discomfort, as well as light sensitivity. Keep in mind, however, that infectious conjunctivitis is highly contagious, so the washcloth needs to be laundered before reuse. Urgent medical care is needed if your child has bloodshot eyes accompanied by severe tearing or light sensitivity, pus-like eye discharge, fever or rash. Seek emergency medical treatment if your child sustains an eye injury, complains of blurred vision or experiences moderate to severe eye pain. Emergency care is also needed if you suspect something might be in your child's eye, or if some type of chemical has splashed into one or both eyes.